Under South Carolina law, physical abuse includes: slapping, hitting, kicking, biting, choking, pinching, burning, drugging a patient or confining a patient to control behavior. SEC. 43-35-10. A person does not have to inflict abuse to be held responsible for the physical abuse. One is culpable by allowing it to take place without doing anything to stop or prevent the abuse. In addition to reporting your concerns to Adult Protective Services, consider having your loved one examined by a trusted doctor who has some history with the individual or your family and will review medical records including medication and dosing. Finally, you may want to make immediate arrangements to move the resident, not waiting for APS to complete an investigation. Though every first step begins with Adult Protect Services, South Carolina also has hotlines set up so you can immediately speak with a person within the Department of Social Services who will be or has access to those trained in emergency care. Bedsores, also known as decubitus ulcers, and pressure sores can usually be prevented by frequently turning the patient and using a higher quality mattresses with overlays. If these simple steps are not taking, Decubitus ulcers will typically develop at the heels, the backs of knees, the buttocks, and other boney parts of the body. Bedsores begin as a red sore on the skin. If left untreated, the sore breaks the skin. Over time, if proper steps are not taken, the wound increases in size and in depth. Eventually, the wound becomes so deep that it may reach down to the bone and become infected. When this happens and antibiotics do not work, amputation may be the only means of saving the patient’s life at this point. If sepsis (blood poisoning) develops and reaches an advanced stage, however, even amputation may not help and the patient dies. Falls are another common problem encountered by the elderly in nursing homes. In some cases, patients may not be properly secured into wheelchairs and fall or slip out. Patients are also left in their beds without rails to protect them. When left unattended by the staff, these patients fall, often receiving lacerations, abrasions, bone fractures, disfigurement and even head injuries. Malnutrition and dehydration slows down healing and can worsen existing health problems. Over time, malnutrition and dehydration lead to severe complications and may result in the death of the patient. In some cases, patients with special dietary requirements are deprived of the nutrition they need to survive. In other cases, patients who have lost the ability to feed themselves are left with food in front of them but no one to help them reach it. Neglect of proper care shows on the individual and their surroundings. Unannounced visits to the nursing home or being asked to wait before you can see your loved one may be a sign that you can’t see with your own eyes. Neglected supervision of long-term care residents who can’t protect themselves and/or may be cognitively impaired can lead to the resident disappearing from (or eloping from) the nursing home. At this point, the resident is vulnerable to serious harm, especially when the disappearance goes unnoticed. Under neglected supervision, vulnerable adults may also wander into a dangerous environment within the nursing home and suffer injuries from neglect. Anyone who suspects neglect, wrong-doing, abuse or fraud regarding a resident in a nursing home, may anonymously Report Elder Abuse & Neglect to Adult Protective Services. South Carolina’s Adult Protective Services is tasked with investigating complaints and Reports Elder Abuse & Neglect against nursing homes for elder abuse, neglect or exploitation. Following investigation, Adult Protection Services is then responsible for seeking remedy, preventing recurrence of mistreatment and providing appropriate medical services for the individual. If you seek legal counsel for damages in an elder abuse or neglect case, Adult Protective Services must first investigate and provide a written Report Elder Abuse & Neglect for the incident(s). 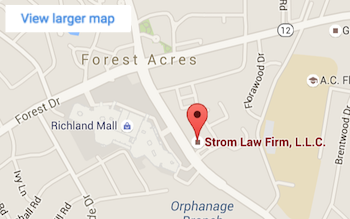 During the investigative period, as your attorneys, the Strom Law Firm would begin gathering information and evidence for your suit, as well as maintain communication with Adult Protective Services on your behalf. In certain situations adult protective services may be able to meet the needs of a nursing home resident who has been abused, neglected, or exploited. If Adult Protective Services concludes that an allegation of mistreatment is well-founded, it will respond by offering the victim appropriate services, such as medical assistance, counseling, special transportation, assistance with money management, or placement in a different residential setting. In South Carolina Adult Protective Services will secure and coordinate existing services (mental health etc. ), arrange for living quarters, obtain financial benefits to which a vulnerable adult is entitled, and secure medical services, supplies, and legal services. Adult Protective Services cannot turn back time to reverse an injury or untimely death. If the victim’s family does not feel satisfied or justly compensated for the injury or indignity suffered at the hands of the nursing home after working with Adult Protective Services, the victim’s family can proceed against the nursing home for negligence. The promise of a place that offers care and safety for you or a loved one is what nursing homes and long-term care facilities are supposed to deliver. And too many do not. We can no longer go about our lives believing family or friends are well cared for by their paid caregivers. 1. Evaluate the Long-Term Care Facility. Watch for nursing homes, long-term caregivers, and assisted living facilities in South Carolina that place profits before patients. Review the following factors at least once a year (as management and facility operations change). Is the staff qualified and adequately trained? Poorly trained staff is a big risk factor that leads to abuse, neglect, exploitation and even theft. Does the facility investigate staff history violence or drug use? Ask for confirmation and notice of new hires. Are there adequate numbers of staff employed at all times? Negligence can occur unintentionally by honest, professional caregivers because of their day-to-day situation. They cannot reasonably keep up with demands because the facility is not hiring appropriately. 2. Make routine contact to monitor your friend or family member’s well-being. Phone, in-person or even e-mail and skype can help you stay in touch with the person’s condition. Is your friend or family member isolated from outside contact or from other residents? Isolation adds to risk of neglect or abuse. Is the resident routinely asked about conditions at the facility? It’s well known that seniors are reluctant to report abuse out of embarrassment or fear. Or trying to not be a bother. 3. Report any suspicions to South Carolina’s Adult Protect Services. Reporting suspicions of elder abuse is not an accusation. It’s a request for authorities to investigate the facility, and those actions could be preventing elder abuse. It is the first step to rule out or establish conditions for abuse or neglect. If Adult Protective Services have not found any violations, and you still suspect elder abuse, neglect or exploitation, consult a legal professional in nursing home abuse. You have the right to recover compensation for ongoing nursing home neglect or elder abuse provided that you can prove that the nursing home breached its duty of care. Do not hesitate to request an investigation from South Carolina’s Adult Protective Services board. If possible, stay involved with staff and nursing home management, especially after a one-time wandering incident. You’ll get better insight into the facility. Plus, the more involved you are, the less the risk to your loved one. If you feel your loved one is not safe, or suffered serious injury from elder abuse or neglect, reach out to our attorneys to learn options for recovering losses for your loved one. We’ll help you evaluate your case.